The Murphy Chamber of Commerce Scholarship Foundation awarded six $1,500 scholarships this month, three to graduates of Plano ISD schools, and three to graduating seniors of Wylie ISD schools. All six recipients are Murphy residents. From left, Abenezer Nuro, Ogechi Ngwakwe, Savannah Callender, Kaitlyn Fletcher and Samantha Sullivan were joined by Scholarship Foundation Chair Jon Lashbrook, a local State Farm Agent. Not pictured is scholarship winner Syed Hassan. Nuro, Ngwakwe and Sullivan are affiliated with the Plano ISD, and Callender, Fletcher and Hassan are part of the Wylie ISD. The Chamber’s scholarship program has been in existence for 12 years and has awarded over 50 scholarships totaling more than $70,000. 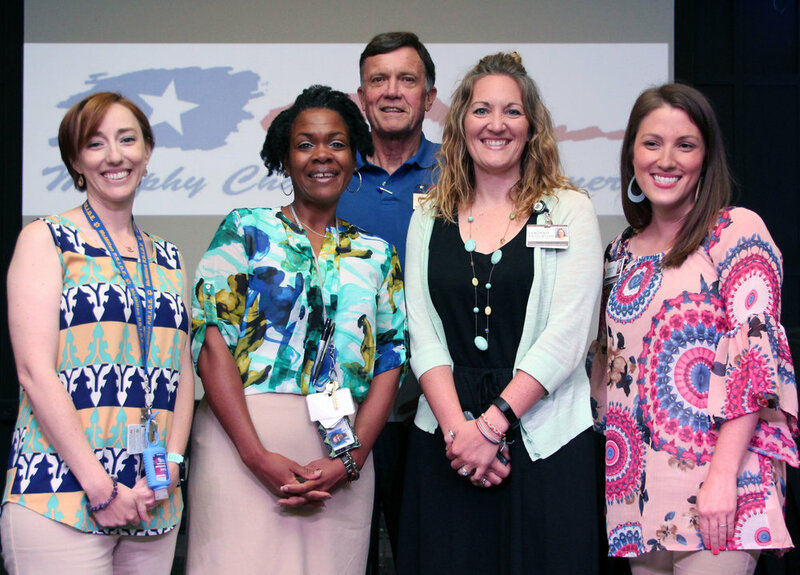 Four teachers were the recipients of $500 grants each to use in their classrooms, presented as part of the Murphy Chamber of Commerce Scholarship Foundation program. Left to right, Miranda Hayes and Keisha Major, both at McMillan High School in the Plano ISD, and Debbie Hazelwood and Amanda Cooper, both at Tibbals Elementary in the Wylie ISD are joined by Jon Lashbrook, Chair of the Scholarship Foundation and a local State Farm Agent. The four teacher grants were made possible through funding from the City of Murphy Community Development Corporation. This is the eighth year of grants to teachers, who use the funds to enhance the teaching curriculum in their respective classrooms. Majors (McMillen High School) will use her grant to continually provide real world life experiences benefiting special needs students through the purchase of ingredients and materials for weekly cooking recipes, life skills, jobs and field trip experiences in the 2018-19 school year. Hazlewood (Tibbals Elementary) will use her grant to purchase educational activities from a company called ThinkFun and to add a new robot to her classroom. Cooper (Tibbals Elementary) will use her grant money to purchase iPad games, update listening center equipment and purchase a subscription to a digital newsletter. Hayes (McMillen High School) will use her grant money to bring a snack cart to McMIllen. She is a speech pathologist. Her students will have the opportunity to sell snacks to administration and office staff weekly. The cart will allow her students to practice vocational skills and expressive language skills with their ACC (augmented alternative communication) method.